Having lived most of my life in Texas, I’ve been a little weary of my first winter up north. Last week we got a small tidbit of fall-like weather, with the nighttime temps dropping into the 40-degree range. I thoroughly enjoyed feeling the crisp air on my face while walking to the train station in the mornings, though I could also feel the crisp air whipping through my thin slacks. In the back of my mind I started to worry about how my walk to work would feel when it got really cold. The first time I visited New York it was in early February and it was bone chillingly cold, no matter how many layers I had on underneath my coat. During that trip, all the “New Yorkers” I saw seemed to be nice and toasty underneath their quilted down jackets and it stuck out in my mind that that is the kind of coat you need when you live up north. Ghastly Gargantuan or Terrifically Toasty? I might feel differently when its 18 degrees outside and everyone around me is shivering while I’m cozy in my down comforter coat. Hello, I am a cute stripy sock. Please ignore my obvious laddering. 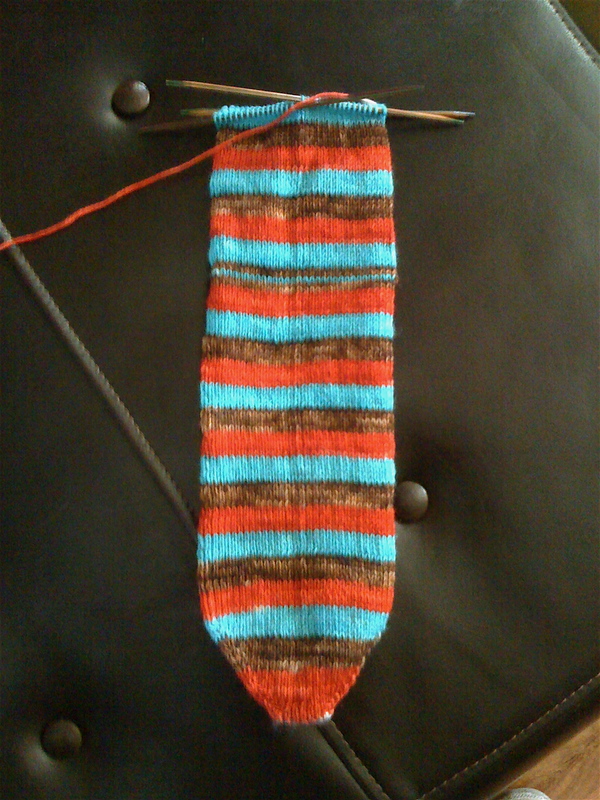 The errant line of blue is where I’ll be inserting the afterthought heel. Maybe I’ll try to take pictures of it- its really a neat way to do sock heels. I keep forgetting to take pictures of my socks I made for travis because they now live at his house and I feel like I’m rarely there when he is to wear them. haha. I always love when people from the south move up “north” and go insane buying super warm clothes. I think its a good jacket and it will keep you warm for sure! It’s hard to look at that coat when it’s still in the 80s here. . . How I long to live in a climate where that would be necessary. 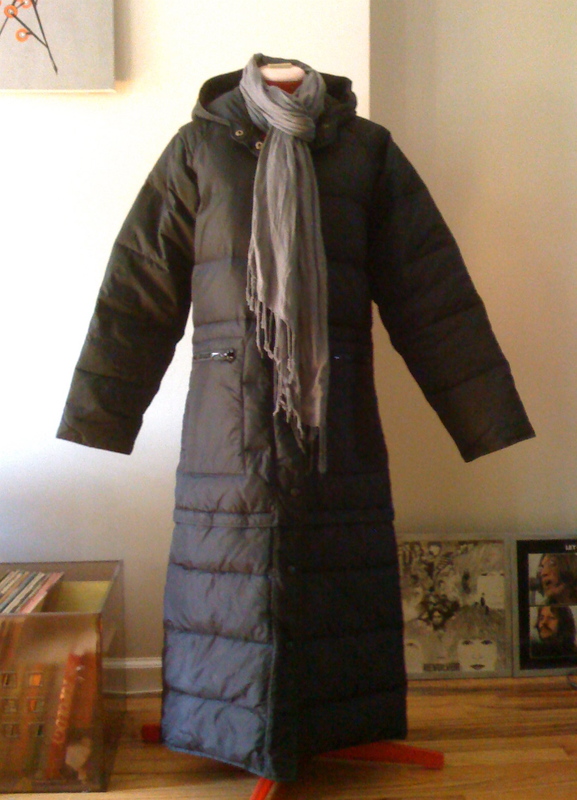 The coat will be perfect for the NY winter. I like it…and you can make it shorter which is a plus.